Let’s face it; Property buyers (especially in Singapore) are generally concern about the tenure when it comes to buying a private property. More often or not, they have that common belief that a freehold property is an asset which you will get to own for life – or at least until someone buys it over or property developers come in for en bloc. Hence, many will perceive owning a 99-year leasehold property is like renting a home and throwing money down the drain. Not only that, I’ve also point out in my last blog what happens to 99 year lease condo’s as their tenure runs out. You know what, they are not entirely wrong. From experience, it’s usually the older generation and so-called more savvy property buyers who are more fixated on buying freehold than leasehold properties, and this belief has been passed down to the younger generation. According to reports, leasehold property launches in Singapore have been dominating the market for many years now. And with the fact that the government no longer sells freehold land under the Government Land Sales programme, you will see more leasehold properties being introduced down the road. Oh yes, you got your Math right – which means freehold properties will get lesser and lesser. If you are only looking at this small segment of the property market, it means that you are going to miss out any good deals within the larger segment of leasehold properties. Here I am going to give you 5 good reasons why you shouldn’t give 99-year leasehold properties the snub. 1. Leasehold Properties Are Cheaper! Well, it’s not exactly cheap if you are looking into places like Marina Bay or Orchard Road. My point is if you are doing an “apple-to-apple” comparison – a freehold and a leasehold property (of similar age) within the same area or district, a 99-year leasehold property will be priced relatively lower (at least by 15 to 20%). Let us look at the following example – comparing Robinson Suites (a freehold apartment along Robinson Road) and V on Shenton (a 99-year leasehold apartment along Shenton Way). 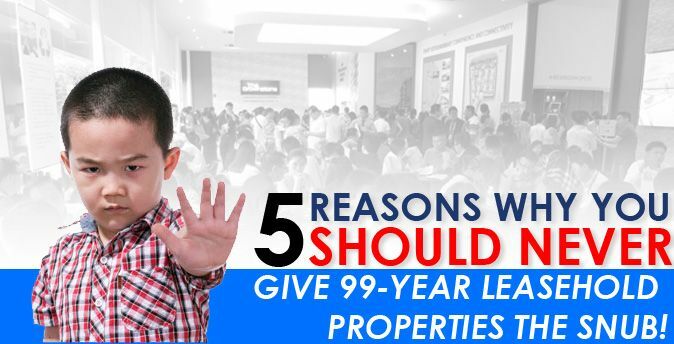 Thus, for some reason if you prefer a certain area/district – be it for convenience to your workplace or for your school-going kids, a 99-year leasehold property shouldn’t make much of a difference for you, and you may end up saving quite a bomb. And in this case – a whopping S$800 psf! If you’re an investor, you’ve probably heard this gazillion times. In most cases, a 99-year leasehold property will be able to provide you with better rental returns & lower level of investment risks as compared to a freehold property in the same area. The reason is simple – because your entry capital is lower and also you can afford to ask for a lower rental amount as compared to a freehold neighbour (and yet obtain a better yield). Looking at the earlier example, a 1-bedroom at Robinson Suites (495 sqft) has been transacted at S$1.406 million, whereas a 1-bedroom at V on Shenton (474 sqft) was transacted for $1.027 million. Both units are located on the 12th floor. Using the most basic rental yield calculation, each unit will be required to be rented out at S$4,686 and S$3,423 per month respectively, in order to achieve a yield of 4% per annum. As you know, a tenant doesn’t really care about the tenure of a property. It’s more of the location, layout and monthly rent amount which they will be more concerned over. As for the capital gain portion, it’s rather subjective and ‘location-sensitive’. I shall leave this point short and you can send me a separate email to ask more about capital gains for 99-year leasehold properties. Like all investment tools – be it shares, bonds, equities or real estate, there are bound to be risks. It’s just a matter of how high or low is the level of risk and how you can manage it when situations doesn’t turn in your favour. This is to add on to my 2 points earlier, so let’s talk a little bit about risk management in this scenario. Assuming market softens and the tenant can only afford S$3,000 per month. As the landlord of V on Shenton, you can still achieve a rental yield of 3.5%. On the other hand, the landlord of the unit at Robinson Suites can only achieve a yield of 2.5% (which may not even be enough to cover their monthly mortgage repayments). Having that buffer to ask for a lower rent, a landlord at V on Shenton will be able to get a tenant faster and not leaving the property vacant for too long. The longer it stays vacant, the more rental income you are going to lose out. And it will certainly start to cripple your bank account if you are servicing a mortgage loan for the property. Well, I did say ‘generally’, didn’t I? When it comes to buying a property, location is possibly the top concern for any savvy buyers out there. Top of the list – must be near an MRT station. And yes, there are indeed freehold properties which are within just next to a MRT station or even a shopping mall. City Square Residences is one of them. Then again, the premium which you will have to fork out is rather hefty. These days, if you are looking for properties situated right next (or just mere short walk) to a MRT station or mall, they are mostly 99-year leasehold. Some even come with great potential upsides down the road. A couple of recent new launch projects, such as Botanique at Bartley, Stars of Kovan and the upcoming Forest Woods condo do possess some of these attributes. So if you are still fixated on freehold properties, likely you will have to deal with the inconvenience which is due to the location of the development (and that’s something which will naturally turn tenants away). On that note, having that kind of convenience may not be everything, especially for locations such as East Coast and Sentosa. It’s going to be a different ball game in these precincts, so let’s not go too much into it. So what’s considered as an ’apartment’ and what’s considered as a ‘condominium’? Over decades, property buyers are still mostly unsure of the specific differences. But this doesn’t seem to affect their decision to buy a property. What I am trying to point out here is that most 99-year leasehold projects these days (especially the new and upcoming ones) are generally larger in scale and are more well-facilitated within the development. They will have larger swimming pools (sometimes more than just 1 or 2), better-looking gyms, 24-hour security, and proper car parks. In fact, this proves to be a draw to most home buyers and even tenants. In recent years, newer freehold properties are usually small developments with less than 50 units, sitting on a very small land parcel and with very basic facilities (sometimes the swimming pool looks more like a plunge pool). Only The Tembusu and Trilive, both situated in Kovan have condominium status and are freehold. Another advantage when living in a bigger development is the maintenance fee. When compared to a smaller development with lesser facilities, the amount of maintenance which you will have to fork out monthly will be pretty much similar. So why not go for more facilities? So, is it a 100% YES for leasehold properties …? In general, if you are buying for own stay, freehold or not really doesn’t mean much – at least to me. I am pretty sure when my parents bought their first HDB flat (which is leasehold too, duh! ), they weren’t having the thought of passing it down to me or my siblings. And yet, I turned out fine in life and tried to work for my own home instead. Personally, I fancy Balestier area and have been living here for more than 30 years. However, home prices here are pretty steep as almost all the private properties here are freehold. If there’s to be a 99-year property launch (which is quite unlikely), trust me I’ll be there first-hand to grab a unit – provided it’s below the median price of a freehold property in the area. 99-year leasehold properties do have their pros when comes to buy it as a home, or even as an investment tool. It’s really about the location you’re buying into and the amount of risk it possesses. Still want to get a freehold for “future planning”? I personally believe it will be more applicable if you go for landed properties. Being a nation where land is scarce, if you have a huge budget and strong financial power, owning a piece of land will definitely be priceless. In my next article, I will share with you some of the pitfalls which you should avoid when purchasing 99-year leasehold properties.